Self seeded no-name Malva–these are fun because the colour is a bit different each new plant. Strawberry–I’ve never noticed how hairy the leaves are! 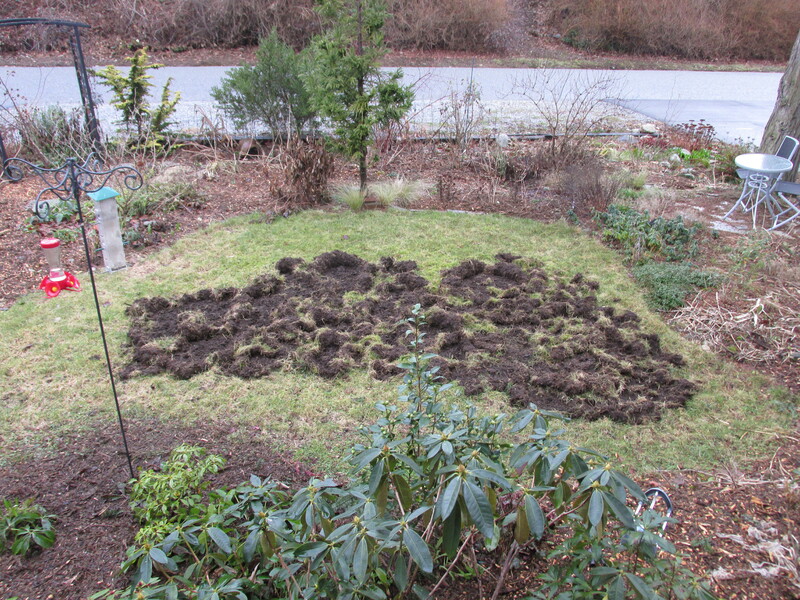 This project started with last year’s chafer beetle damage. 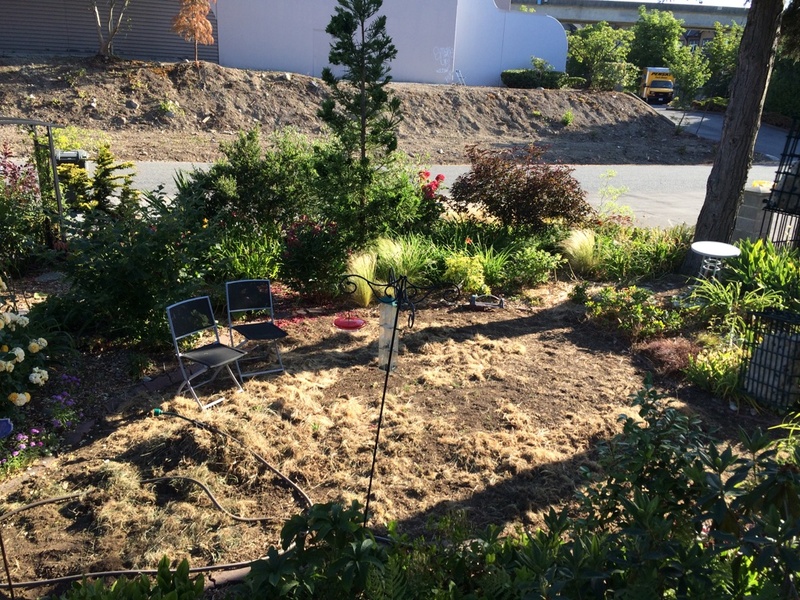 Initially I thought I’d take out the grass and plant a native/wildlife garden with three birch trees front-and-centre. For some heretofore unclear reasoning, I decided on a pond instead. This picture was taken about Dec 1 2014. Lots and LOTS of racoon damage. So I waited for spring, and then started to rip out the grass. Literally “rip” it out; the grass was so damaged by the chafer beetles there was hardly any roots left to fight with. Thanks to my sisters for helping me clear the grass. 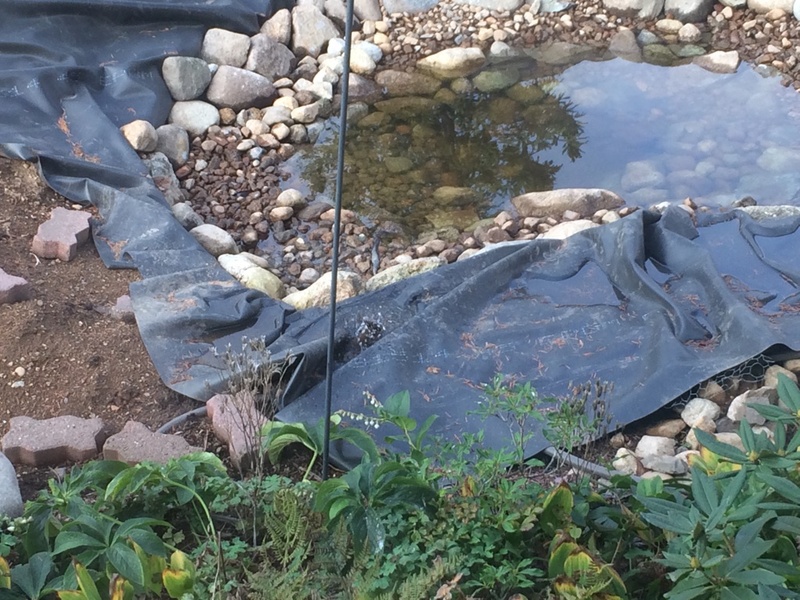 I wanted to use as much space for the pond as possible–apparently (or so I read over and over as I was researching this project) the main regret new pond owners have is that they didn’t go bigger. But as you can see, there isn’t that much room, and I need to be able to walk all around the pond without having to dig out shrubs and trees to do it. 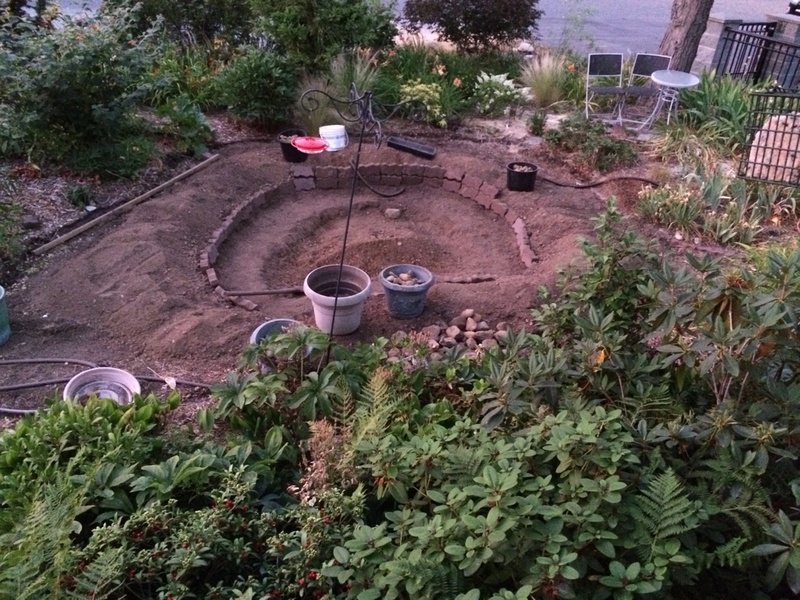 Outline of the future pond. 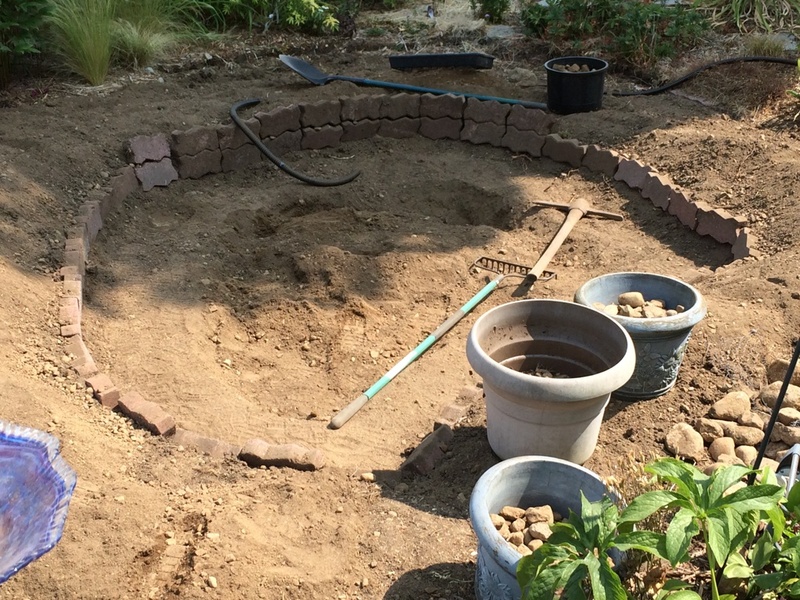 Difficult to maintain nice vertical walls with this sandy soil, so using bricks to buttress the edges. A lot of rocks in this ground. Over the years I’ve deposited quantities of rocks across the street in the gully, and this garden section is no different. Hence the need for the pickaxe! 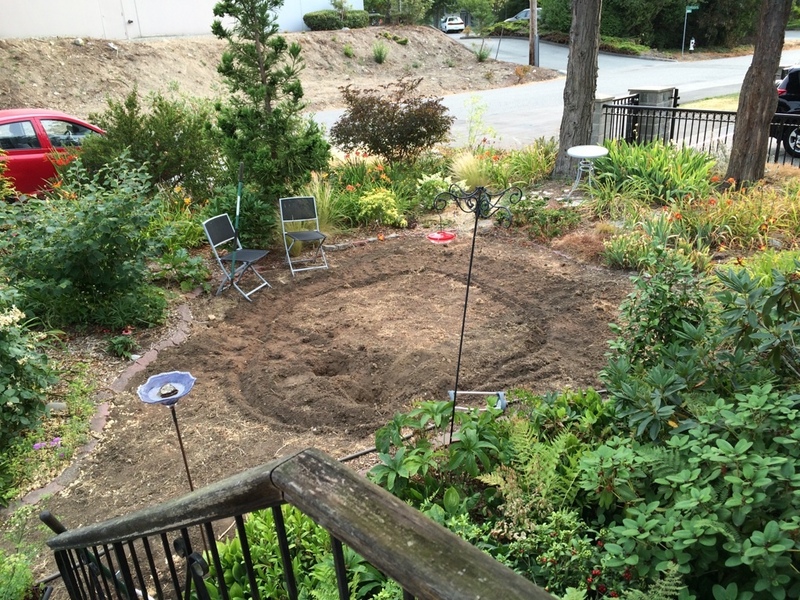 Beginning to dig a second “terrace” so there’s appropriate places for a variety of plants. Some water plants prefer deeper water, like water lilies, others, like papyrus, prefer it more shallow, while still others just want their roots wet, but the crown of the plant above water. Thus the need for three different levels. Beginning the deepest section. It needs to be at least 24″ if I ever want to keep fish. Narrowly missed water and gas lines, neither of which were where they were supposed to be. Digging complete. 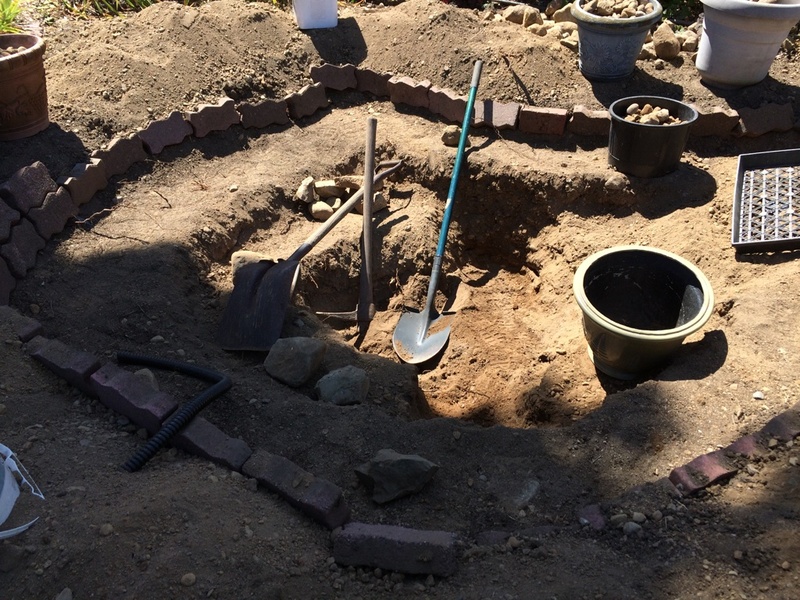 Nine buckets of small stones, a good pile of mid-and large sized rocks, and no end of gravelly material salvaged from the pit. 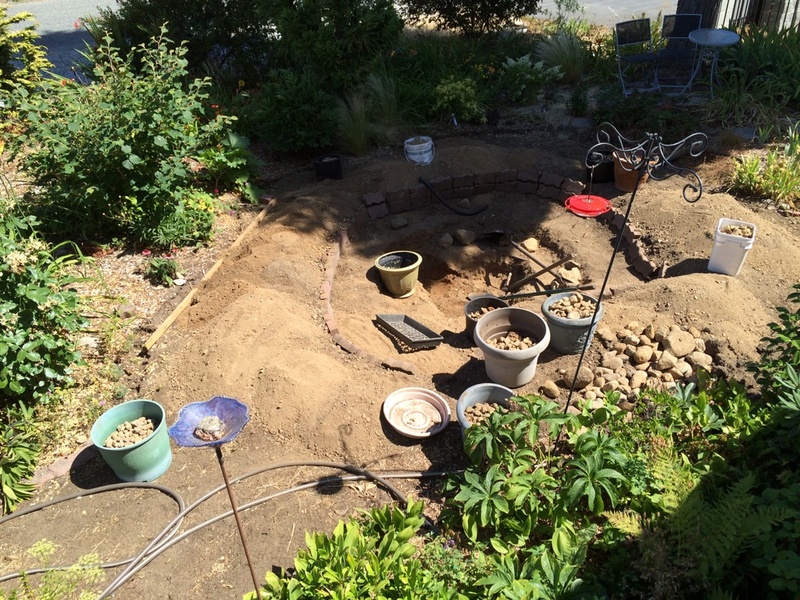 I finished excavating and was ready to lay the IPDM membrane when Level 3 watering restrictions were announced. Which meant I couldn’t fill the pond. And if I lay the membrane and then it rained, I’d have standing water in the pond, being unable to fill and pump the water. 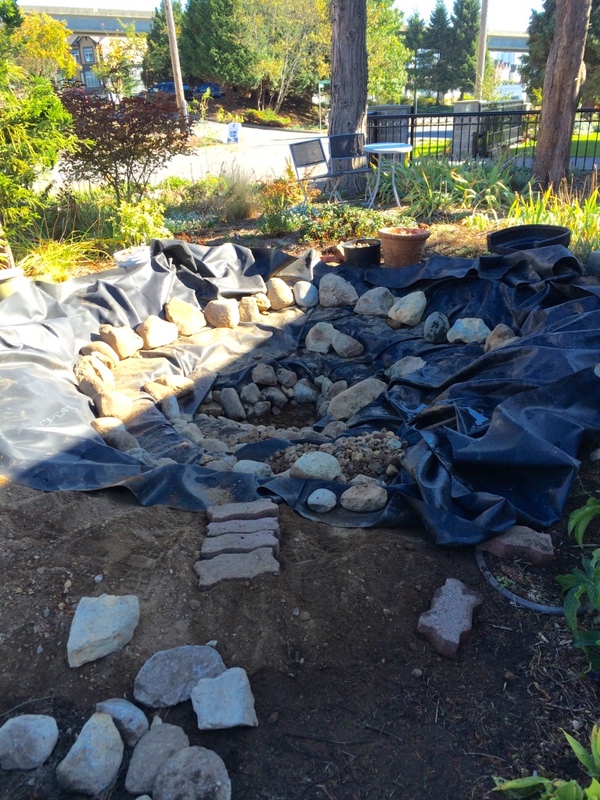 So I started this project June 22 and finally lay the membrane Sept 28! 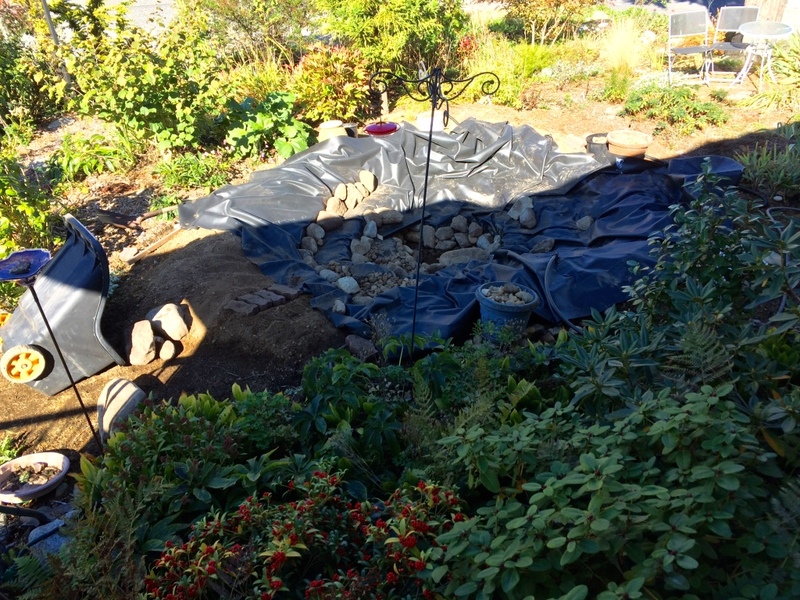 Local watering restrictions have finally been lifted after a few deluges in recent days, so I can lay the membrane and line it with rocks. Despite the gratuitous number of rocks I harvested from the site, there still weren’t enough large ones to line the walls. Never mind, I know where to find more–across the street in the gully! Larger rocks to serve as walls, smaller for the floors. 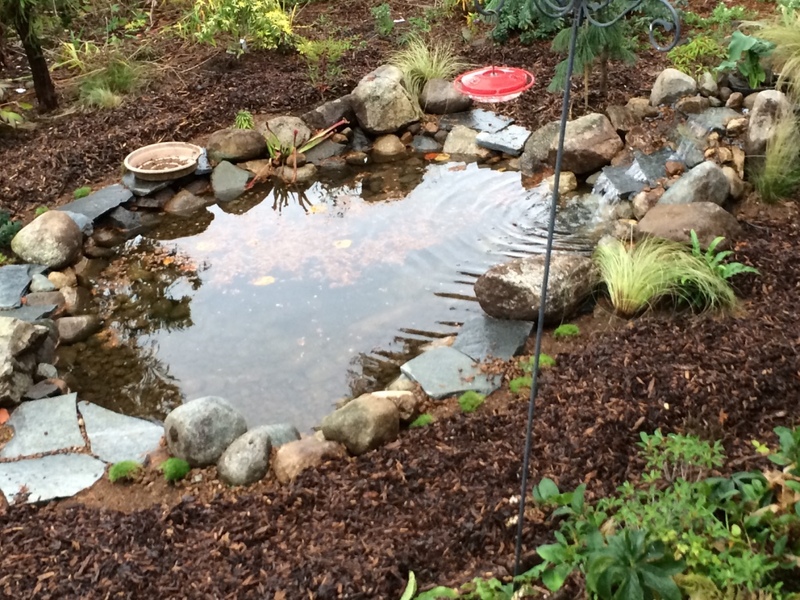 I don’t really want fish in my pond, because I don’t need to give the racoons even more reason to trash my garden. 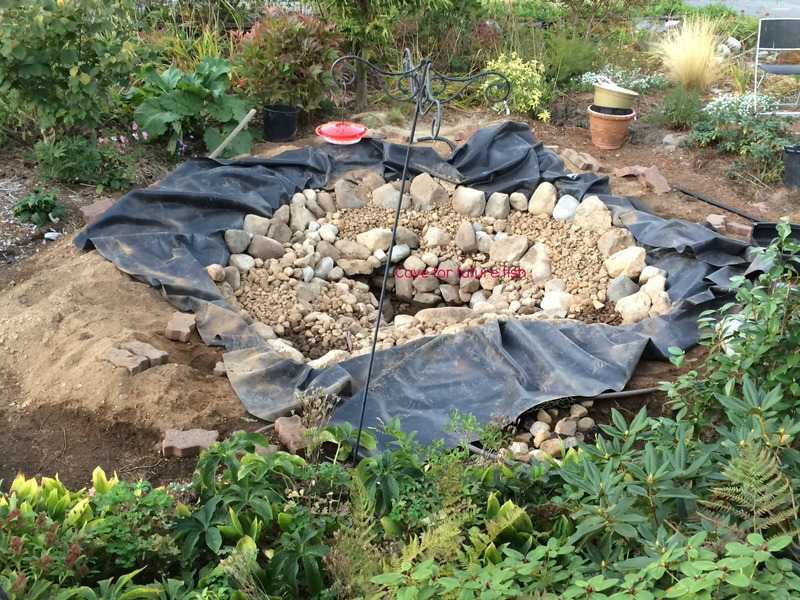 However, I may change my mind in the future, so just in case, I dug the pond deep enough to allow fish to overwinter successfully, and created little caves to give them hiding spots from the inevitable predators. I’ll also have floating plants to provide more hiding places. Two little caves created for potential hiding places–in case I decide to get fish in the future. Click to enlarge to see where one is just visible. And here’s the final product. 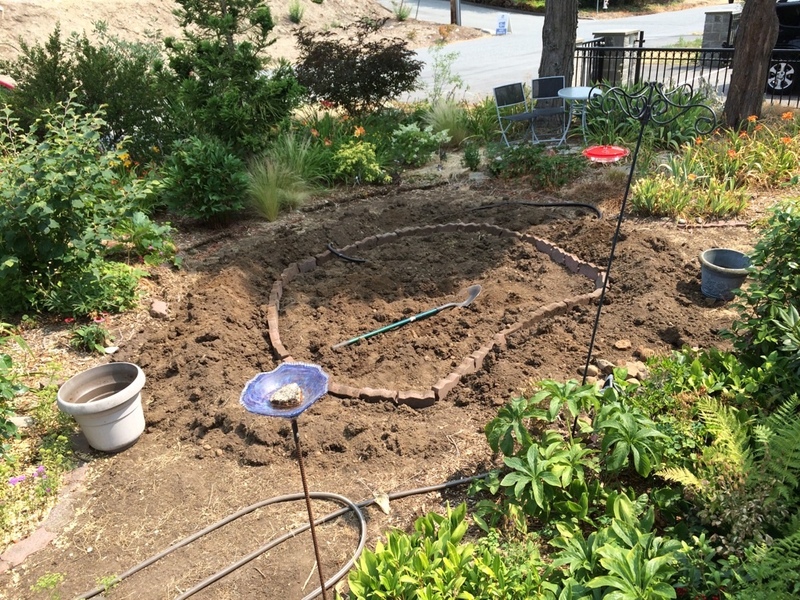 I’ll do a little more planting in the spring, and there’s water lilies ready to go in now–as soon as I figure out how and where to plant them. Looks like I’ll need waders. You’ve endured the saga, so here’s your reward. Enlarge for a better view. Hope you like it. Is Your Pine Loosing Needles? 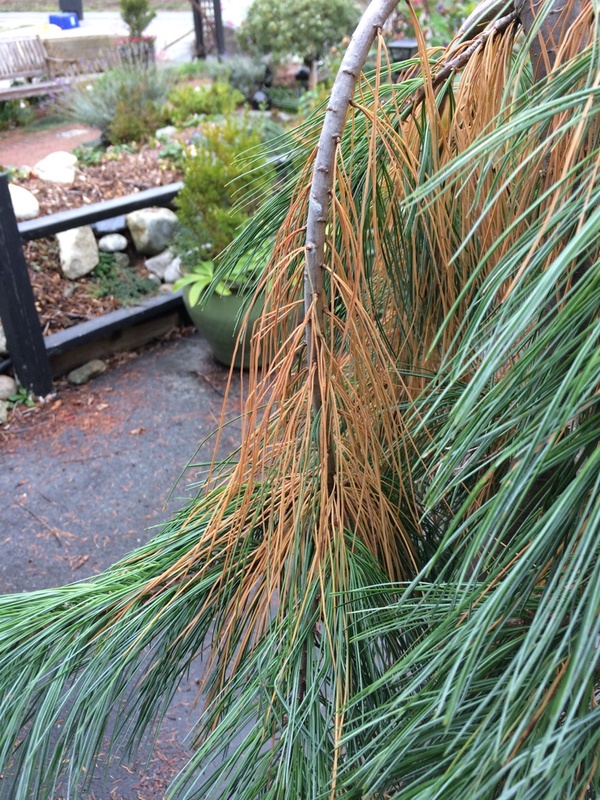 Those are dead needles, and on an “evergreen”, one thinks “dying tree”. But no need to worry after all. Even evergreens lose “expired” needles or leaves. Everything that’s living and growing will eventually discard dead cells, and that’s what’s happening here. The “joint” where the needle or leaf meets the branch develops what’s called the “abscision layer”, where cell activity and enzymes create a weakness, hence leaf- or needle-drop. You can see that the dead needles are all higher up the branch, while the branch tips are all still green. This is a good thing! Different species will keep their needles for more or fewer years–the Pinus strobus (White PIne) above only keeps its needles for a year, so there’s constant change happening. I’ll look forward to watching its development. 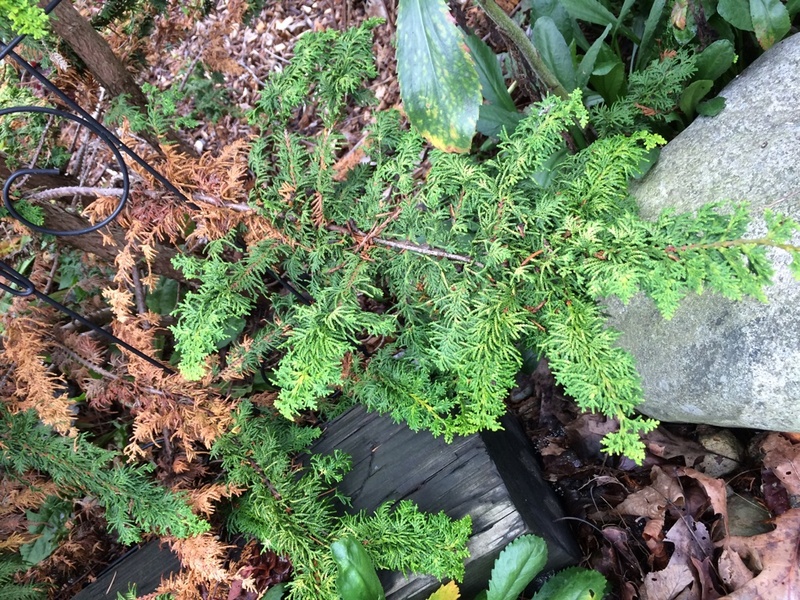 This Chamaecyparis obtusa ‘Fernspray Gold’ is losing three- or four-year-old foliage. Meanwhile, the green current growth will be turning a wonderful coppery colour pretty soon (hence the name ‘Fernspray Gold‘), before turning green again next late spring. 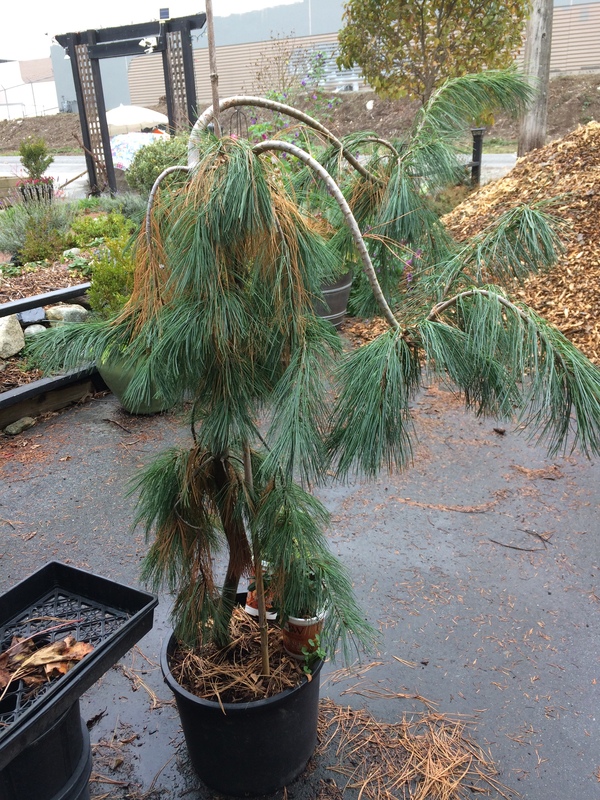 Your broadleaf evergreens will be doing the same (leaf drop), but may not look so dramatic. This rhodo is losing three-year-old leaves. You can see that the leaves at the top of the picture are current year’s leaves, then follow the stems down to find last year’s leaves, and finally the third year leaves that are yellowing. 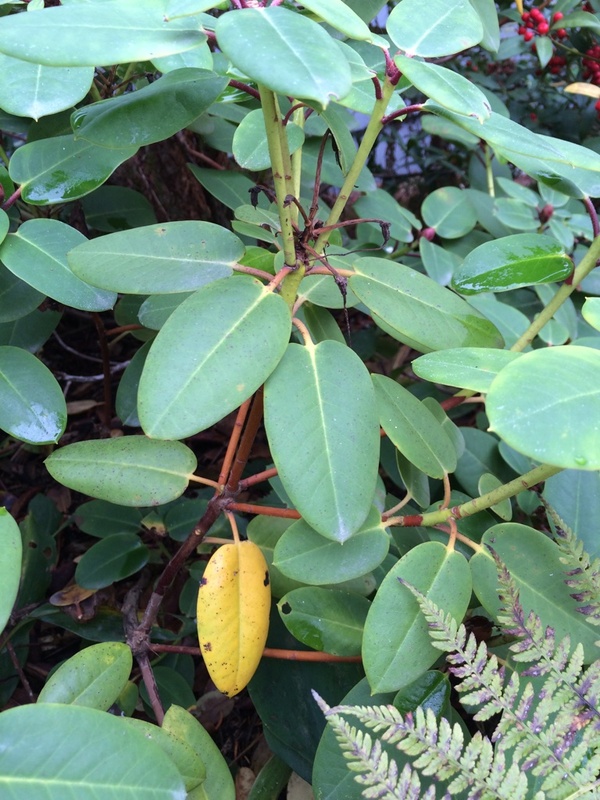 But you can see it’s a very healthy specimen–probably the happiest rhodo in the garden. So as long as the foliage that’s falling isn’t this year’s foliage, you can probably not fret too much about it. If you want to find out how many years your own tree/shrub holds its leaves, U of Nebraska has a page you might find useful. 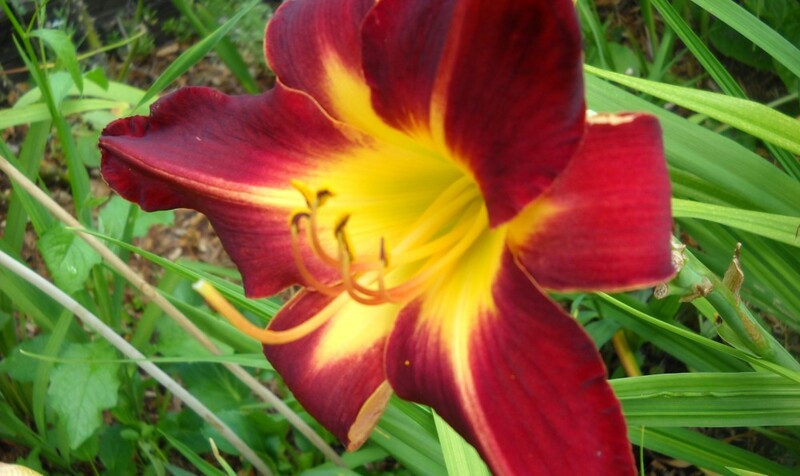 For a little more in-depth reading, inthegarden offers this article.